Flemish painter, draughtsman, sculptor and etcher who became a painter to the imperial court in Prague. His unique style combining elements of Netherlandish painting and Italian influences, in particular the Roman Mannerists, had an important influence on other artists in Prague and beyond. He trained with Cornelis van Dalem, Jan Mandijn, and Frans Mostaert, all three landscape painters. 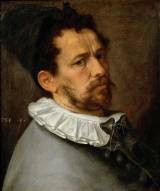 He further copied prints of Frans Floris and Parmigianino.He traveled to Paris and then travelled on to Italy, where he first stayed for eight months in Milan. He then worked for three months in Parma as an assistant to Bernardino Gatti on the painting of the dome of the Santa Maria della Steccata. He worked on wall paintings in various churches. In Rome he became, like El Greco, a protégé of Giulio Clovio. Here he also met Karel van Mander who would later include a biography of Spranger in the Schilder-boeck. Pope Pius V appointed him court painter in 1570. He was summoned to Vienna by Maximilian II, Holy Roman Emperor, who died soon after his arrival in 1576. But his successor Rudolf II was even more keen to employ him, and in 1581 he was appointed court painter and also valet de chambre, the court having moved its seat to Prague, where he stayed until his death there in 1611, shortly before Rudolf was deposed. Rudolf arranged a wealthy marriage for him, and his house was a centre for artists in Prague. Spranger's paintings for Rudolf mostly depict mythological nudes in various complex poses, with some connection to the Emperor's esoteric Late-Renaissance philosophical ideas. His paintings are the most characteristic of the final phase of Northern Mannerism. By far the best collection is in Vienna. His drawings have great energy, in a very free technique. Aegidius Sadeler, who lived in his house in Prague for some time, and Hendrik Goltzius made engravings of his paintings, spreading Spranger's fame around Europe.